That is not a problem for us with bicycles. You can ride a bicycle and enjoy the cold, but fresh air while avoiding ice patches and cars that are stuck in the snow and skidding along. A lonely winter road with packed snow as road surface is just lovely. But sadly that kind winter wonderland roads are scarce when living in a large city that are filled to the limits with cars, lorry’s and people rushing around all the time. Perhaps the first week after a heavy snow storm it might be lovely snowy roads in the city. But as soon as the road crews are out with their sanding machines, the before snowy white winter wonderland roads turns into large swamps of grey melted slush. They spread the sand on streets, pavements, cars, people and forest paths. The sand is everywhere! On the main roads they also use salt. Road salt that melts the ice so the cars got good grip. It works! But when it is cold the snow do not melt, instead it turns in to boring, grey, salty slush. Riding a bicycle in that kind of slush is not fun at all. First of all, the bicycle tires are not made for that kind of artificial road surface. When the snow is packed it is all just fine! But when having to cruise in 10 centimetres thick greyish swamp-ish slush that are covering roads it is a different matter. The tires just keeps digging down into the slush, snow and ice. The slush get stuck on everything, wheels, mudguards, luggage rack, clothes, its is everywhere. The really sad part is that the salty grey slush also corrodes metal quick! That is really quick! After riding in that kind of poisons slush the important thing is to wash the bicycle with water and keep it stored inside rather quickly. After the Helsinki Tweed Run my two bicycles was covered with a thick layer of that corroding grey salt slush. I do not have any place to wash the bicycles so all I did was wiped them fairly clean with a cloth right away after arriving home again (the cloth turned black after the wiping). My intention was to ride the bicycles one at the time to a car wash at an petrol station nearby. They have separate stalls for car washes where you wash your car by hand. You pay a fee and get to use the wash equipment for a limited time. Just finished washing the 1956 Hermes at the petrol station. As soon the snow melted a bit and it was relative dry outside. I took the bicycles for a ride to the car wash. I guess many of the car owners raised their eyebrows a bit when they saw me standing there washing a old bicycle instead of a car. I covered the sensitive parts on the bicycles like saddle, handlebar grips, headlights and cranks with old plastic bags. After that I covered the entire bicycle with a cleaning agent and then washed and rinsed it all with water. Final treatment in the wash was to use a new cloth to dry the bicycle and polish the chrome/nickel parts. 1938 Wiklunds, Nordstjärnan (Northen star) got a well deserved wash. Not the Helsinki tram rails rust on the front tire. That will never go away. A visible memory an an fun event. After cycling home and enjoying the first warm rays of spring, I dismounted the wheels and greased the axles and bearings with new grease and a drop of oil where needed. Even the spring to the stand was creaking after all corrosive salt slush from the winter. It got cleaned and lubricated with a drop of oil. Polishing and cleaning. That is a spring event. A sure way to say good bye to the winter and greet the spring welcome. It has been a while since I last wrote here. Well, as usual I have no good excuse for not writing. More that laziness and that the weather has been bad (says the fellow who wrote an article about riding a bicycle in Helsinki in the middle of February). That is true, but can I say to my defence that I actually had nothing interesting to write about? After all, reading about bicycles and more bicycles can be a bit boring for you. Considering that I once stated that the motto of this blogg was “my view of things around me”. Then the question is, how difficult can it be to write things that are around me? Strangely, not difficult at all. But, what can I write to still keep the level of my writing style? I can of course write political articles, reviews of things that I tried. I could write endless posts about movies, music, life and so on. But would I like to do that? Strangely, yes and no. If I started a long time ago and kept it all under one roof, all writings, thoughts and articles collected here under this blogg. Then it would have be a great collection of my views. An time line over what I, as a person, was developing. Different interests and ideas over the years. But after starting this blogg rather recently. I realized that I wanted to keep it clean, no statements other that “tweed is nice” and “vintage bicycling is the bees knees”, you get the point. An sort of silly, harmless writing about things that offends no one. That is what we really need at this day and age. More harmless silliness about nothing. So here I am, writing about old bicycles and Tweed hoping that I offend no one. In fact, now when writing about it. I realize that I never have written anything about tweed it self, the cloth. All my experiences of the cloth with stories from my early teens up to the present. The change in fashion and other ideas all over but how tweed always was important and why a grey herringbone tweed was important for me. Could that be something for you to read? Or I could write about my ideas for a new bicycle project that I have been thinking of for many years. Once I had an old Swedish military bicycle from the 40’s. Sadly it was in a pretty bad shape and was later even stolen. But today, I would really like to get one again and this time really try to get it in good working order. It would be fun, they are heavy, but reliable! I can also now officially let you know that I have an vision to participate of 5 different Bicycle Tweed Rides/races/runs this year. That vision brings me to the issue of bicycles in general. After all, I really would love to only have one good vintage bicycle that I could use and participate in different Tweed Rides. But as now, I had different bicycles in every event. There is more articles to write about. In fact, when thinking about it. I have no time to do something else than writing. The questing is how to earn money on writing? To something completely different. The weather today was an lovely day in the spring with lots of sunshine and chirping birds. In short, it was a perfect day to take the 1956 Hermes bicycle for a ride. I have not moved or looked at it since my return from the Helsinki event, I have not even cleaned it yet. But still the tires had full pressure, nothing on the frame was loose. I brought my tweed jacket and took a ride. It went smooth as silk. They knew how to make great bicycles back then. Today I took a ride on the Pelago that I have, the one with three gears. It was such a nice weather this morning. The sun was shining, only a few degrees below zero, birds was singing. A lovely day for sure! 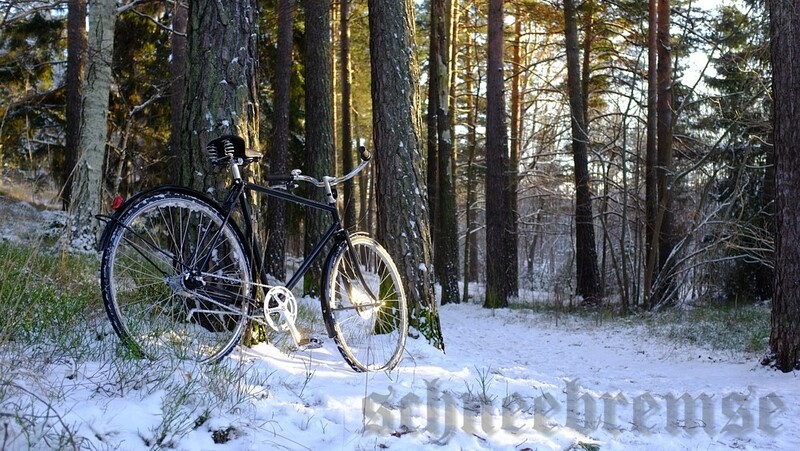 I took a ride to the place where I always take photos of my bicycles just for fun, adding a winter photo to the collection. I am leaning the bicycle against the same tree every time I am there and takes a photo. Just for fun. A sad note is that I will most likely sell the Pelago to a friend, he want to buy a good bicycle that will last him many years. He has currently an old Swedish army bicycle that he never uses. Because it is so heavy to use, with no gears and a frame that are made of solid iron (it feels like that anyway). The tires comes straight from an old tractor or somethi9ng like that. I mentioned to him that I have this black Pelago bicycle and I am not really to happy with the gearing (I am used to only one gear and finds 3 gears a bit to much, “less is more” so to speak). Perhaps I will take his army bicycle and fix it up to original condition. It would be a fun project. We will see how it all turns out. As I was sliding along in the snow I was thinking of the fact that tomorrow is new years eve! Then the year 2014 is over and we are entering 2015, a new year! It feels strange in a way. After all, it was only a few weeks ago I mentioned “Bike in Tweed”, right? It can not be a whole year ago?! Anyway, a year ago I was going on about how I really wanted to be a part of the Bike in Tweed event next year (this year 2014). How I got an tandem bicycle and everything around that bicycle with my attempt to fix it up. Only so I could enter the tweed event. Then got other bicycles that I was also fixing up in time for the tweed event. But due to some odd planning I could never join the tweed event. I remember the disappointment I felt when I realized that it all went down the drain with my planning. But soon, really soon it will be 2015 and I will make a new attempt to join the tweed dressed people in a bicycle ride around Stockholm. This time I will not make any promises. But I can say that I will really try the hardest to be there next year! Since of the renovating of “lady blue” last winter and the tandem bicycle this summer. I am currently having 2 more projects in the cellar that you have been reading about. It is the old Monark bicycle that I will build into a “ride-for-fun” bicycle. I will try to make it as good as possible, I realize that the style is not going to be typical like the 30-50’s era. But it will be a reliable racer with a very own style. Then I still have the Pelago frame with all parts that I have bought. I am trying to bring together to a retro path racer, also as you might have been reading about earlier. How that one will turn out, well that is a different question. All parts and so on is a quite a challenge to bring together. Or at least put it all together so it all fits in a good way. I realize that I might have taken a chance with that project. But I will try to complete it as good as I can. It will be an expensive and complicated learning experience. But fun! So far I have learned lots of things I did not know about bottom brackets and the different styles of taps, cranks and all those other things. Things you never think about when riding a new bicycle that you bought. Especially for me that in all times have been mending and fixing old bicycles that was made in the 40’s. The Pelago is brand new, using brand new components and techniques. I hope both projects will be completed until the “Bike in Tweed” event in September 2015. Then I have 4 or even 5 bicycles hanging around. The question is what bicycle I ride, but also who will ride the others. I hope that the blond girl would like to ride “Lady blue”, she said it would be fun. But she needs a tweed dress, in a weak moment of confusion. I said that I would help her to find a dress. But I have no clue of where to find a vintage tweed dress in her size. Or in any size of that matter. I know where she can find new made dresses in tweed. But they are not so much vintage looking. I will try to persuade her. For my own appearance I am thinking of buying a new tweed suit, since I gave away my old one. For me personally the brand is not an difficult option. For me there is only Harris Tweed. The cloth is made in the Outer Hebrides islands just north of Scotland. The cloth are woven by the weavers in their homes and the cloth is then sent to the tailors that also are located in Scotland. I am thinking of having a dark colour tweed suit this time since I am using a grey herringbone tweed jacket almost everyday, it might be a good idea to change colour sometimes. Beside a dark suit is usable in so many different settings so I think it is a good investment. Not only a fun thing for use at an bicycle race around the city once a year. But it is representable at party’s and other social events. After all, tweed never gets old or out of style. Back at work I have talked to a bunch of people about the Bike in Tweed event that they would like to join it to with their own vintage bicycles. It sure would be a real treat if we all could join and experience that day. If that happens I will post a photo of us here, along with an report from the day. Bicycles, tweed, tea and sandwiches. But I hope that 2015 will have more fun events with bicycles and also having nice picnics. Packing up an old spirit stove, a can of beans, bacon, eggs, bread and make an English breakfast outside in the nature. Of course the enamel mug for tea is joining. Why not make it in to a photo shoot to? I think the blond girl would like that idea of a tweed picnic. This year was not so bad out of bicycle view. I got much made on my own bicycles and I actually helped out a friend with his family’s bicycles. I repaired and adjusted them and did an general overlook of them. It was easy thing to fix, but it was also fun to work with bicycles. 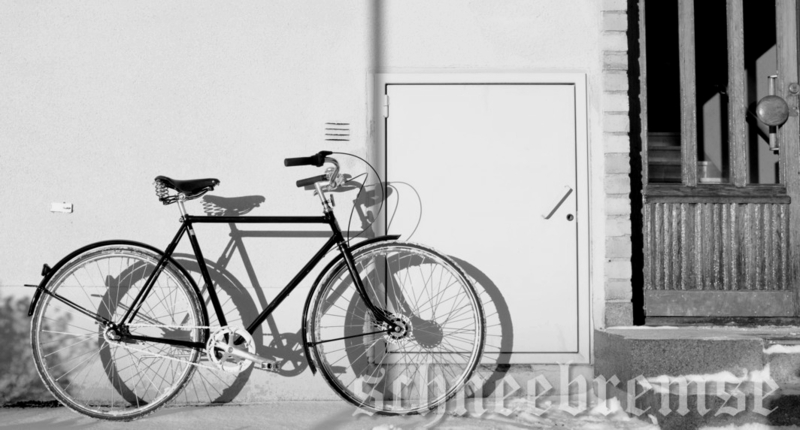 One of the ones I was adjusted was an old Swedish army bicycle from the 50’s same style as the one I mentioned earlier! All original and in a great shape. A great rider, made for riding thousands of miles on old gravel roads. I hope that the friend will join the tweed event 2015, or perhaps a picnic. After all there are so many advantages with an old bicycle, you get exercise and fresh air. Saving the environment and getting healthy at the same time. Noting bad with that really. When getting back home from my winter ride. I removed all the snow from the tires, rims and frame. I wiped off the water from the mud guards and pedals. Back in the basement, parking beside Lady Blue and the other bicycles. See you all next year! Finally I wish all my readers a great 2015. I hope it will be filled with lots of nice rides and many great memories.